Dennis J. Patterson, Ed.D., is the Founder and Chairman of Verras LTD, a 35-year-old healthcare informatics firm that creates high-performing hospitals, through a transformational process leveraging physician practices, clinical documentation, productivity, and organizational change management. He more recently Co-Founded MedVector, a company that will transform Clinical Trials in the pharmaceutical industry by recruiting subjects from an exclusive network of hospitals and delivering the clinical protocols through telemedicine within that network. He has nearly five decades of executive hospital and turnaround management experience in the United States, Canada, and Europe. 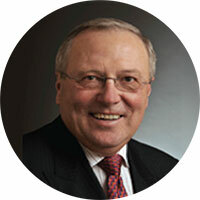 He also serves as a trusted advisor to senior executives, trustees, and government officials in healthcare worldwide.